Let the children get a break and learn the magic of quiet time for little kids with this genius mom tip. I wish someone would have shared this with me earlier to do with toddlers and my preschooler to grow their imagination and teach them how to independently play better. The kids played together nicely for .5 seconds after breakfast, the music is blasting and you’re trying to start a dance party, and then the older one shoves the little one to the ground and the screaming begins. After sorries and hugs, they play nicely for another minute or so before some other tiff starts. This pattern continues for the next hour and finally, you’ve had enough. A momma’s saving grace and a best friend to help little ones get a social break and force them to grow their imagination. I swear every home needs to do quiet time. It was the one thing that held us together when I was going through some of my darkest days with postpartum depression. My baby was about 8 months old and taking three naps a day. 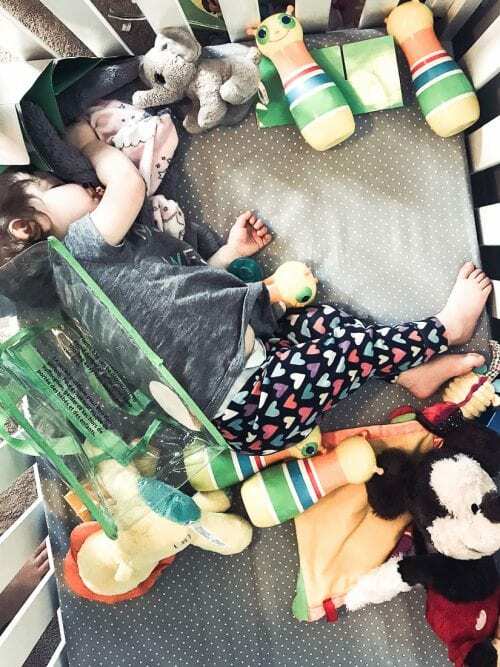 My 2.5-year-old was taking one nap a day, but probably could have used two naps a day still. When Maggie woke up from her second nap, Clara was headed down for her nap after lunch and as soon as Clara woke up from her nap, Maggie went down for her third nap. It was a vicious cycle that lasted for months and I was losing my mind! One day I was chatting with my sister when she mentioned her friends implement quiet time for all their kids starting at 18 months old. I watched a Facebook live they did explaining what they do and I was sold! Since implementing quiet time, Clara’s in a better mood, she’s better at independent play, and I’ve watched her imagination blossom! It was crazy how quickly we saw the benefits of quiet time. One day after quiet time I walked in to her room to see this setup she did with her little “friends” painting at a table with apples on a stick like she did in preschool the day before. 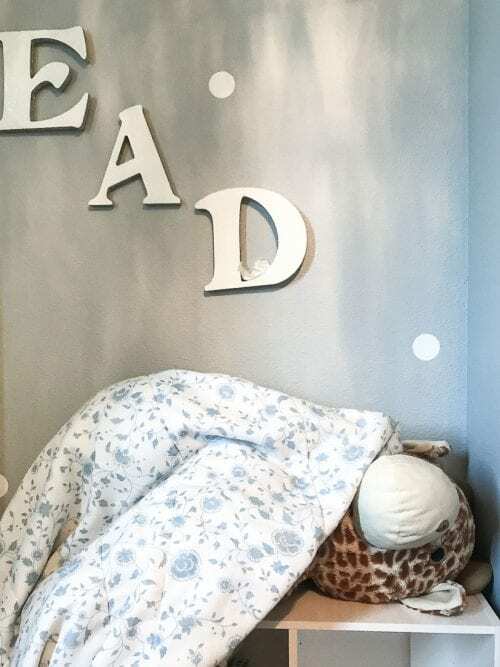 There’s usually at least one or two stuffed animals tucked in for bed somewhere in her room too and you have to be “suuuuuper quiet” so you don’t wake them up. It’s been so much fun seeing her imagination grow so much just by forcing her to use it. We do imaginative play a lot during the day, but it’s different when mommy and sister are around. This article explains seven benefits of quiet time and I agree with every single one of those reasons if you aren’t convinced. Do quiet time at the same time every day if possible. It helps kids understand the routine and just becomes part of the day. If we’re busy doing something in the morning, my preschooler is more often than not going to ask me if it’s time for quiet time yet. I HIGHLY recommend you use a clock of some sort so the kids don’t feel like they’re stuck in their room forever…they have that visual reminder of when quiet time is over. Some days are a little tougher and she just needs a gentle reminder to play until her clock goes off. This clock is our favorite that I recommend you get. There is a nap setting—that I can’t imagine any parent actually ever using for naptime—that is super easy to set and then it chimes at the end of the quiet time and the child can just hit the button to turn it off. Start with 5 minutes at a time and work your way up. I can’t stress this enough. Build up your little one’s confidence they can do this and enjoy it. Each day add 5 minutes until you are at whatever time your kid will continue to play peacefully in their quiet time space. We tried pushing it up to about an hour and 15 minutes, however, at around 1:05 she would start getting antsy and say she was ready to come out so we moved it back down. I’d rather she have an hour happily playing independently and continue to love quiet time, then push to get an extra ten minutes of peace and quiet for momma. Have toys split up into different containers and put high on a shelf that are special quiet time toys. Before quiet time, Clara gets to go to the closet and choose what she wants to play with that day. She has some stuffed animals and lots of books in her room already, but this one special thing is the key to getting her to go into her room peacefully and happily. She LOVES quiet time and has loved it since we first started implementing it and I think it’s because of the excitement of the “new” toys. Once Maggie dropped her first nap around 17 months old, I started implementing quiet time with her too. Granted, she falls asleep about half the time, but I’ll take it. 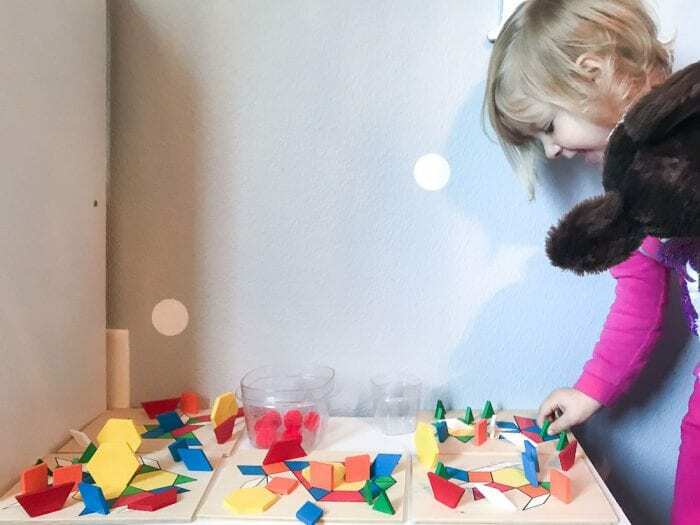 Her favorite is building with megablocks or playing with the stuffed animals. She usually starts out playing and then about halfway through quiet time crashes peacefully until Clara’s clock goes off and then quiet time is over. We do the same routine with her as I did with Clara toThis helps her differentiate between naptime and quiet time. -One box of toys in the crib with her. -Add 5 minutes each day until you find the sweet spot. 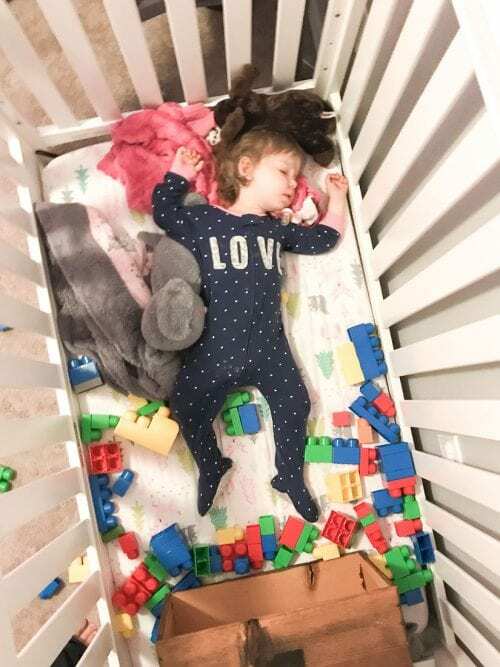 If we are out of the house when we usually do quiet time, Maggie gets very confused when it comes time for her nap and she wants to take at least one toy to bed with her because she thinks it’s quiet time—aka time to play in her crib. On average I would say Clara stays in her room the full hour 98% of the time with no complaints. Maggie is still learning about how amazing quiet time is, but she makes it the full hour about 90% of the time. The point of quiet time is to rest, relax, and recharge. Sticking kids in front of the tv is not doing that. Don’t just turn on the tv for them. Give them an open-ended toy that encourages them to be creative. I, in no way, am saying screens are bad. Just don’t count screen time as creative quiet time. It’s different. You can see my opinion of letting toddlers watch tv here. When quiet time is over, clean up the activity. 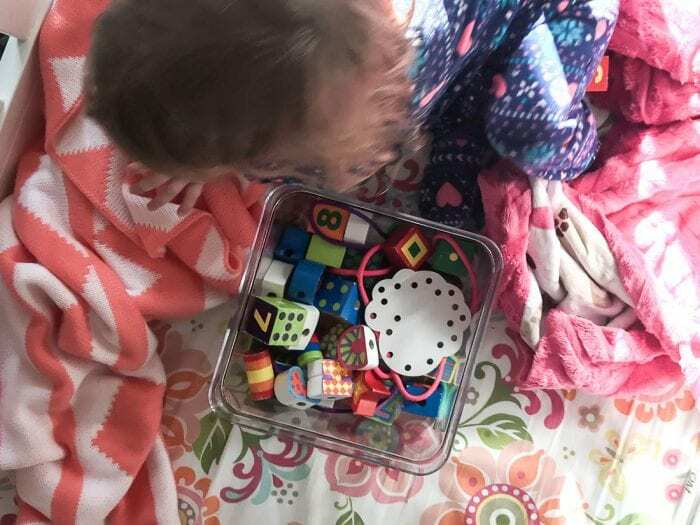 Clara knows to put her quiet time activity back in its box and then it goes back in the closet until the next time she chooses that as her quiet time activity. 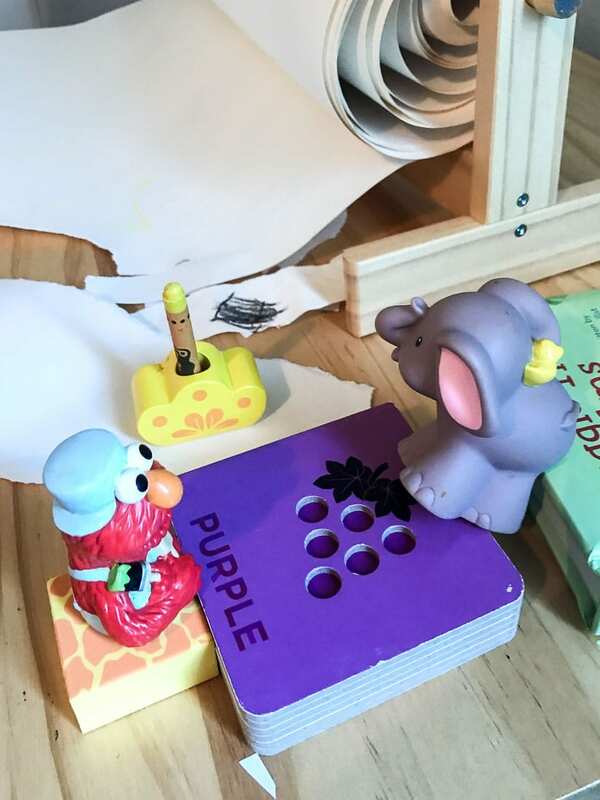 Maggie is still learning, but we sing the cleanup song after quiet time and I have her help put her toys into her quiet time bin. So, are you ready to start implementing quiet time? Below I’ve included some of our favorite quiet time activities based on age. Click on any of the links to see the ones I recommend if you’re feeling stuck. Baby, clothes, and blanket — On more than one occasion I’ve caught Maggie on the camera monitor rocking her baby and tucking her in with a blanket. Looking for more quiet time activities? Check out these 54 mess-free ideas! I’ve found that you can usually find some pretty good quality toys at your local thrift store and new toys are new toys to kids. They don’t know any different so if you’re needing some “new” toys to stash away, be sure and check your thrift store out. Our girls love each other, but we also can get on each other’s nerves. The saying, “absence makes the heart grow fonder” has never been more accurate than after I watch my girls run for hugs after quiet time and then play peacefully together for the next 2.5 seconds. Now that Clara isn’t always napping in the afternoons, we’ve also implemented quiet time in the afternoon when needed. I try and convince her to nap, but if all my bribery and tricks don’t work than I either set her quiet time clock or tell her she needs to do quiet time until her sister wakes up (whichever I think is going to be longer). As our kids get older, we plan to continue doing quiet time and having them do their quiet time as needed or at busy times like when momma is trying to get dinner on the table. Quiet time is so good for kids and mommas. It gives me a break in the morning to catch up on house chores, have a meeting, load the dishwasher without some tiny human trying to climb inside, or gives me some time to get some work done. I wholeheartedly believe every mom with little kids should work on implementing quiet time in their house. It has changed the mood in our house tremendously and I am a firm believer in the creativity it has helped nurture in my girls. Do you implement quiet time for little kids in your home? How does it work and I’d love to know what your favorite quiet time toys are? Share in the comments below!